When we first reported that the X99E-ITX was announced, we got a clear coarse reaction in the comment section. On one side of the equation were a group of users who were waiting for this sort of product to hit the market. Something small that could cater to SFF builds but still retains premium performance – a great video from Linus and Luke at LinusTechTips shows how this board can fit into something like a shoebox with an 18-core E5-2699 v3 CPU with off-the-shelf water cooling, 32GB of ECC memory, dual SSDs and an NVIDIA Titan X graphics card as well. The other side of the crowd, and by far the biggest, expressed an element of WTF and dismissed the product as either a stunt or a waste of money based on the Haswell-E features that a user would not get by going with something this small, namely multi-GPU setups or quad-channel memory. At the time, users also stated that it was ‘a board just for Ian’, based on my own personal thoughts on the matter. Perhaps it can be construed as true. I like engineering, and something that combats the performance/size curve is interesting even if it isn’t relevant. I have approached all the major motherboard manufacturers since the launch of X79, asking them all more than once about whether a mini-ITX board on the high-end platform was possible and if one would be made. All of them came back with comments similar to the second lot of users I describe above, stating that the drop in memory channels or the lack of multi-GPU use would cross such a product off of the list for potential X99 customers. Volumes would be considered too small compared to the engineering required, and many wrote it off in a similar fashion – even ASRock at first. That being said, ASRock is a company that over the years has always dared to do something a little different to the competition. Motherboards such as the X79 Extreme11 with tons of SATA ports or the X99-E/WS 10G with built-in 10GBase-T Ethernet are two such examples. If I were to have put money on a manufacturer going for a high end mini-ITX platform it would have been them. Seems like I could have made $50 on that bet. Even though part of me wants to think I’m responsible for requesting this, ASRock has stated that I wasn’t the only person asking. Even then, based on the ‘finally!’ moment I had when it came to market, I thought twice about even reviewing it, in case any bias crept into the review. In that regard, I want the results to do the talking. The base line arguments when we started were surrounding a lack of multi-GPU and dual channel memory limiting the bandwidth total capacity. The first one cannot be helped in such a small form factor, but we can address the second. Our results show that memory bandwidth, moving from quad channel to dual channel, does not cut benchmark results in half. Almost all our benchmarks are still CPU bound, and almost all regular workloads are too. For enthusiast users working on specific software packages, there may be fringe results that see a loss, but on the whole, even in gaming, we saw little to no difference. Transcoding large frames saw a small 10% deficit, and something smaller in WinRAR, but that’s about it. For capacity, at the time the X99E-ITX was announced, there were no 16GB UDIMM modules on the market – we were wholly thinking along 8GB DIMMs, meaning 16GB total. That changes with 16GB UDIMMs, as it now allows 32GB total. That being said, dual channel kits of 16GB modules are not in the market yet, and we might have to wait for future platforms to come to market before that happens. Motherboard performance for USB, audio, DPC Latency and POST times are all within the regular X99 window and we do not see any detriment in that regard. As this is the first USB 3.1 motherboard we have tested, it comes top of that chart unsurprisingly. 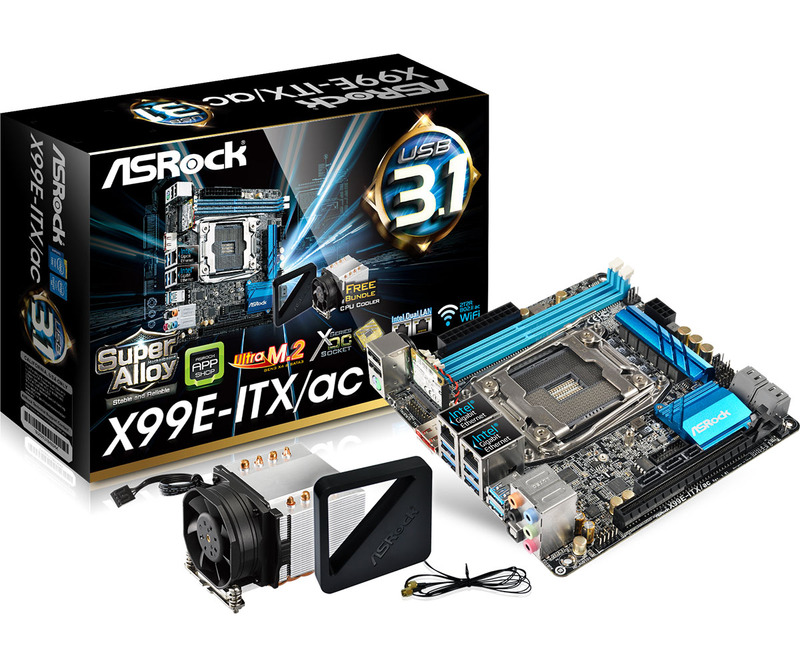 I mentioned at the start of this review that the other motherboard manufacturers will be looking at the ASRock X99E-ITX to see whether the small form factor ITX market is bigger or smaller than their internal numbers suggest. At this point in time, it becomes a recommended motherboard by virtue of it being the only X99 mITX motherboard on the market, and is currently available for $250 ($300 MSRP). 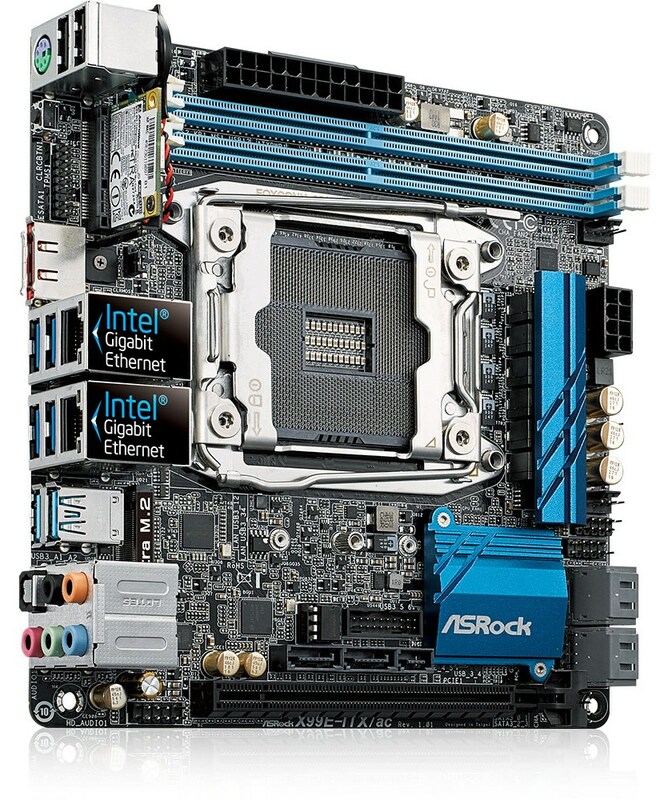 To supplement some of the initial backlash, ASRock has at least designed it well with some high-end features and it seems to be getting a lot of exposure. The results show that dual channel memory is not a problem in many situations, and the inclusion of a narrow-ILM CPU cooler and magnetic CLC bracket gets around the socket issues. Based on feedback, there will always be detractors for this type of product. For everyone wanting a small-form-factor machine on the high-end platform, there is only one choice. Straight from the article "...where we can use up to 8 cores with consumer processors or 18 cores with Xeons – double the threads with hyperthreading as well"
I am more wondering why they bothered with USB 2.0 and I would of liked at least one USB 3.1 internal so I could hook it up to the front of my chassis and onto a USB type C.